How did the friendship League get started and what is it all about? In our role as consultants, we do a lot of work for Special Olympics, and I noticed that the DPRK did not have a chapter. While on a trip to Pyongyang to run entrepreneurial workshops in 2015, I (Scott) was driven past the ice rink and told that the DPRK has both men’s and women’s national teams. 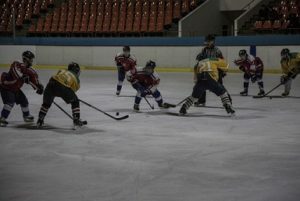 We came up with a plan to organize an ice hockey tournament in Pyongyang as a means of breaking the ice and hopefully gaining the necessary trust and connections needed to start sports programs for individuals with an intellectual disability. The plan worked, and we hope to one day see DPRK Korean athletes competing in the Special Olympics World Championships. What sports programs do you have and how many countries is the friendship league in? We have held three annual hockey events in North Korea, and will be hosting our first annual soccer event there this September. Our team has also organized a flag-football exchange in the beautiful Costa Rican beach town of Puerto Viejo. This November, we will be hosting our first ever hockey event outside North Korea in Ashgabat, Turkmenistan which we are also very excited about. There are also several new destinations on the horizon as our organization grows. If someone wanted to join one of your events how would they apply? We make no restrictions based on age, gender, nationality or skill level provided the host and sending country have placed no restrictions. All people need to do is send us an email to contact@friendshipleague.org or visit our website http://www.friendshipleague​.org and all the info they need will be provided. Participants are required to pay a tour fee to cover the cost of their travel and a donation to support our sports programs for individuals with an intellectual disability in the DPRK..
Over the last couple of years you have had Hockey events (Pyongyang Ice Hockey League) in North Korea, Why North Korea and how did you get your foot in one of the most closed nations in the world? I have always been fascinated by North Korea as somebody who studied international law. In 2014, I was on my way to Bangkok for a work placement at the UN and decided to swing by Pyongyang for a brief tour. The experience left me with more questions than answers, so I became determined to find a way to return as more than a tourist. That opportunity came in the form of entrepreneurial workshops in the cities of Pyongsong and Pyongyang. While there, I realized that there is a lot of common ground that can be found with the DPRK concerning social development goals, and began to look for ways that I could make a difference. It was the connections made during that trip that would eventually give us access to the local ice hockey community. How were you received when you first went to North Korea? I had watched countless documentaries about North Korea before I went, including the Vice Guide to Travel series, so I was expecting everybody to be very cold and strict. The truth is, I felt the opposite. People have always greeted us with a smile, and work quite hard to make sure that our time is enjoyable. Most people that I meet are quite curious about the outside world and are just interested in getting to know you. What is the quality of hockey in the country and how is the Friendship League supporting hockey in the country? 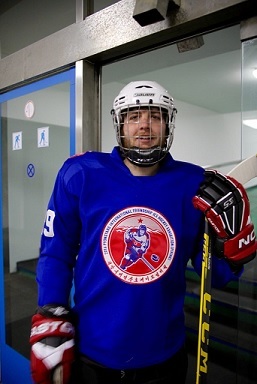 It’s difficult for the hockey players in the DPRK because they don’t often get the opportunity to receive outside training and guidance. That being said, they are very talented and disciplined players. Overall, the country has about 1500 players and competes in both the men’s and women’s IIHF. While they’re not in the top division yet, they are improving quite quickly. Every year it gets just a little bit harder for our participants. What is the one misconception people have of North Korea? It’s not so much a misconception but a barrier to knowledge, but I think the biggest thing is our failure to see North Koreans as humans. Western media coverage has, at times, carried sensationalist stories that have had the effect of dehumanizing ordinary North Koreans. Our participants often talk about how they are shocked when they see a North Korean smile. It’s not that they thought North Koreans were unable to smile, but it is something they had never previously seen. In the end, North Koreans are just people. You mention that you do sight seeing, are you restricted to where you can go or are you free to go where you want and how is the food in North Korea? Yes, we are restricted in where we can go. Our participants are not allowed to leave the hotel without having guides present, however, the guides are very friendly and work hard to accommodate guests requests. When we want to go somewhere new we just ask them, and usually we are allowed to go. It can actually be quite nice having the guides nearby as they are very knowledgeable and help you get around. The food is quite good actually. We eat a different restaurants every day for lunch and dinner so participants get to experience a wide range of cuisine. The local specialty is Pyongyang cold noodle, and meals generally consist of a selection of communal dishes which people can choose from. For those who crave western food, Pyongyang is home to several surprisingly good pizza, Italian and hamburger joints. What sporting events are you running this summer? This summer (September) we will have our first annual Pyongyang Soccer League event, where we will play against an elite professional team from Pyongyang. Our next event after that is Turkmenistan in November. At the end of the day what do you hope to accomplished with Friendship League? Our immediate goal is to develop a program capable of sending North Korean athletes with intellectual disabilities to the Special Olympics World Championships. HIFL participants help achieve this by continuing to engage with officials through sport, and by making donations to support the program. Beyond that, we hope to bring thousands of adventurous athletes on life changing adventures, and look for new avenues to leave an impact on the local communities we visit in the process.